Short Walk to Walmart & to Express Metro Bus. Free Parking for 2 Cars! Our lovely Washington DC home has received nothing but glowing reviews since we began renting it., Over and over again, our guests comment on how spacious,lovely, convenient, and inviting it is—not to mention the warm welcome they received upon arrival! and the immediate and perfect service. so we can guarantee an excellent stay. We can also guarantee total help so that you feel completely at ease during your stay. Taking advantage of the end of the year (2014), we proceeded to totally renovate the house so as to keep it new. To make things perfect, the house is in a quiet neighborhood yet very close to an express bus going straight to attractions as well as Walmart. It is also centrally located allowing an easy access to all Washington DC has to offer in a matter of mn. Perfect for families or other groups, the two-story, three-bedroom house is truly a “home away from home.” Start each day with a fresh cup of coffee and home-cooked breakfast, which you can enjoy in one of two dining areas or on the front porch overlooking the garden. Then spend the rest of the day exploring Georgetown, one of downtown D.C.’s world-renowned museums, Silver Spring, Arlington—all of which are only minutes away by car. After sightseeing, return home to the comfort and privacy of your rental and watch a movie together on the 50-inch HDTV. All three bedrooms are located on the second floor, including the spacious master suite, which comes with a queen-size bed, full bath, and a private sitting room. The larger guest bedroom also has a queen-size bed. The 3rd guest bedroom has a full-sized bed. The two guest bedrooms share a bathroom, and there is a third full bathroom located downstairs. The kitchen is equipped with high-quality appliances and a full set of dishes, and we've included all the linens and soap you might need. You’ll also find a library of books, and more. Fast Internet and cable TV. Finally and if you filter for the number,variety and quality of amenities, you will realize it is unique. The proximity to everything, the beauty and comfort, the convenience, the remarkable number of amenities, as well as a perfect family caring service, make it the perfect place to stay at. To book your dates, please contact us right away as our calendar often fills up in advance. We look forward to hosting you! World traveler who knows what it is to find a trustworthy host who will bend over backwards to make your stay perfect. I like to treat my guests exactly the way I like to be treated. Knowing that you will be here for a short time, everything will be done to help you get familiar with the city, the transportation and every aspect of your stay, to save you time and for a convenient perfect stay. Top quality home with a very affordable rate, it does not get better than this. As soon as you confirm I will send you a document that will answer all your questions in such a way there will be no inconvenience whatsoever. I want 0 inconvenience for my guests and I achieve it, before they come, during their stay and after they leave sometimes. As mentioned, our home is centrally located near major roads and public transportation stops, , which makes it a breeze nd to visit any attraction and to explore D.C. and the surrounding areas. We’re also located 2mn walk from a metro bus going to the the Mall, Verizon Conference center; our home is an ideal place to stay at if you are visiting DC attractions, family gatherings or on a business-related trip. The perfect and trustworthy service will make you feel like family and that is major if you are a traveler. Moreover, it has all the amenities. Trust, location, Beauty, comfort, size, convenience, service, rate and proximity, have always been consistently delivered and shown. That is why we are able to guarantee that you will like your stay and all of the above. The uniqueness about this house is its likability, its generosity with its diversified, numerous and quality amenities. In fact It has the highest number of amenities (if you filter for the amenities it has, it will be the only one shown.. It is very simply lovely and makes you feel truly at home. Most people who stayed in this house said 'It was perfect' and that the pictures did not render justice to the house for it has recently been through an upscale renovation. You have the feeling you are in a new house with everything at its place. You just need to organize the groceries and you are ready to enjoy the house. But the single most important feature about this house, is the willingness of the host to bend over backwards to make your stay as enjoyable as possible, through a thorough orientation prior and upon arrival, tips and so forth. With available brochures about DC at hand, you will have everything you need for a great stay. All Bathrooms Have Showers And They Are of The Highest Quality With Ceramic Tiles Covering Most Places. Is so functional that you will feel cool after a warm day. The house is nicely heated. All linen provided and extra are available. Just above the washing machine. We have a very nice electric fireplace below the TV, when lit will not only warm the place but provide nice colors that will make you feel wonderful. Parking for two cars just behind the house. Very convenient. very powerful and convenient wifi, all over the house. Has sofa and nice coffee table facing a very nice Sony 50" TV. A suitable electric chimney with colorful flames below the TV. dishes and utensils are available to make you feel at home. Fully stocked kitchen with available spices and numerous cooking things you would not need to buy. fenced garden, allowing kids to play safely. Relax on the Porch, big enough for 8 persons. at 1.5 miles there is a very good swimming pool with free parking. The owner speaks fluent French In Addition To English and offers driving orientations to help guests get their bearing very fast. This row house is spacious with 3 bedrooms and 3 bathrooms, all with either shower or bath. That’s the good news. The bad news is the deferred maintenance and sloppy jerry-rigged wiring along with generally low quality cooking implements and lack of cutting boards and decent knives, etc. Location was very good for us, which made up for some of the problems with the house. ). So people think and look at the same things differently. Thanks to the beauty of diversity. Other guests made suggestions and I always follow through on them, just like these ones definitely. We try to reach a perfect situation but people have different tastes and we need to have a feed back in order to suit their every respective need. By the way, all bathrooms, regardless, have showers in them, not either . Glad you enjoyed your stay though. Your review is unclear at times and explicit at others, but I hope I clarified things in my response. That is why I guarantee full satisfaction because I make sure everything is fine and adapt to any particular needs of my guests should they need to. That is why the house is kept in an excellent condition and there is not a single issue in it, none.Thank you for giving me the opportunity to reassert and stress this basic need of asking in case of need. That will help my future guests who will be very satisfied, just like those before and you will see their comments. I also give an opportunity to future guests to correspond with previous ones if they so desire. I also wish to thank you for leaving the house clean and following the rules. I appreciate that. Adam's place is very nice and roomy. All linens and towels were supplied. It is in-town and north of the Capital Area. Some items should be replaced but Adam was very responsive to any issues we had. Overall a good experience. Great place for our family group of 7. Can't beat it for the price, location, and comfort. Host Adam was very accomodating, and responsive. Would definitely stay here again. My family and my sisters family, including 3 tween to teen boys had a great stay for a week. Easy access to the metro, and the DC area. We had a wonderful stay! Adam was very easy to work with, always responded quickly and even checked in with us. He gave detailed instructions and directions, which made our arrival and trip much easier. There were 6 of us, my husband and I, our two boys (15,11) and my in-laws! We all had our own space and plenty of room. Not to mention our boys are man size! 😂 We were out all day and into the evening but it was nice to have a place to stay were we could all gather at night and not have to be in separate hotel rooms. We knew Adam was around if we needed anything! We would stay again if we ever make it back to D.C., which I hope we will one day!! Thank you for your wonderful positive attitude and your highly considerate behaviour. It was wonderful having you and I miss you already. Please come back. Very clean, nice neighborhood and owner is very responsive to questions. The townhouse is in a quiet neighborhood and is everything we needed for our stay. Adam answered every question and even checked that we made it home safely because we woke up to a lot of snow on the ground. Its was overall a very enjoyable experience. It was so great having you. You were like feathers. I miss you already. 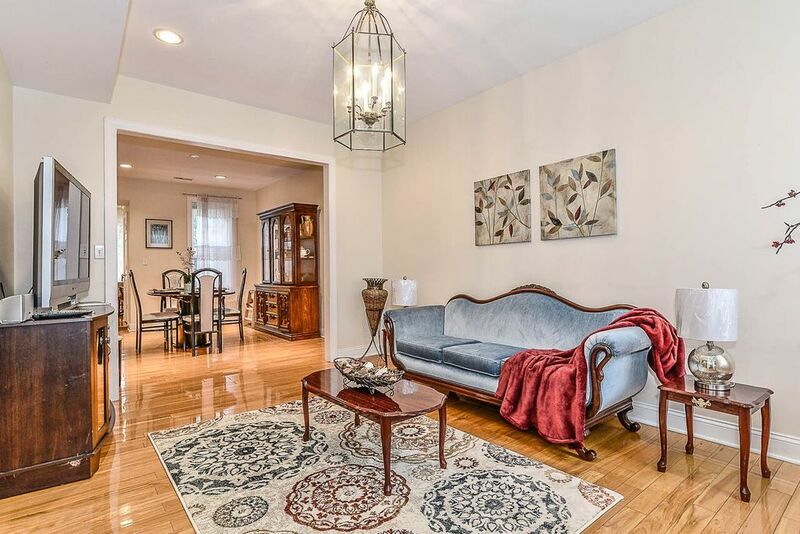 This house is located in Petworth , just 2 blocks from the bus that will take you straight to the Space Museum and just 1 mile from the Rock Creek Parkway, that will take you to Georgetown in 10 minutes by avoiding the red lights, the Lincoln Memorial in 15 minutes, Arlington Cemetery in 16 minutes. Rock Creek Park will allow you to hike, walk and bike. The Eastern entrance of the Zoo is at barely 3 miles. It is also close to the bus stop that will take you straight to the Space Museum and the Mall in about 20-30 minutes, 4.5 miles (including the red lights). It is also near a bike rental that will give you the opportunity to bike, with available biking routes, should you need to, and to great sport facilities located at respectively 1.5 and 3.5 miles from the house. Silver Spring, Md is barely at 3 miles (easy drive) with its free evening parking, restaurants and movie theaters. The metro is at 1.5 miles from the house and there is a bus shuttle at the corner of the house, going to the Metro. There is a big parking at the metro. The metro has 3 metro lines going anywhere. Depending on where you want to go, there is a specific option that will be indicated to you upon a thorough orientation at arrival. Activities: shopping, health/beauty spa. Walmart just opened nearby at walking distance, Georgia Ave. and Missouri Ave. People walk their pet even late at night. The house is therefore located just like at the summit of a pyramid. Everything is minutes away.